The Retro Ride 26 Inch is a stylish cruiser tire with Continental's legendary KKS 10 all-conditions tread. The wide construction provides cushioning and suspension over rough terrain, and head turning Cream and Brown rubber options perfectly match your classic ride. A robust rubber belt beneath the top layer helps prevent punctures caused by broken glass and thorns. 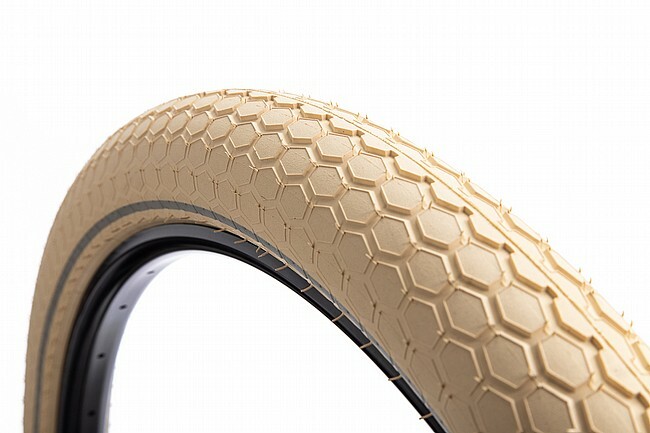 The Retro Ride 26 Inch tire features a three ply casing for a total of 66 TPI. Available in 26 x 2.2 Inch (50-559 ISO). 58 max. PSI. Wire bead. 920 gram claimed weight. A reflective sidewall stripe increases visibility after dark. Cream, Brown, or Black. I ordered a pair of BROWN Continental Retro Ride 26 Inch Tires. The color shown on the net is a nice chocolate brown. The actual, real life color is a lighter, muddy, almost pinkish brown. I'm really disappointed. I won't put these on my Townie. Love these tires on my 41 Rollfast vintage look and roll so smooth!!! Smooth speed rollers that I bought for my 1941 Rollfast, They have a vintage look on my bike. I love these tires. I wish they made a 26x2.35 model. Bought these for my bike because I'd fitted a pair on my daughter's cruiser and loved how comfy they felt. The brown tires look ace on my converted 26 mtbtourer with fat Wald fenders. Since buying, I've been researching tire width vs speed, and at the right pressure (40psi) they are pretty much as quick as anything I've tried, at half the price of fancier equivalents. I put a pair of these on a Specialized Shark cruiser that my wife found at Goodwill for $20. It's a sweet ride if I do say so myself. These tires cap it off with a retro look. Their width offers a very stable ride and they are very supple. They were a cinch to mount. Nice soft ride with these tires. Wish there was better puncture protection, got a flat after riding about 14 miles from a thorn, I was riding on the pavement too. Otherwise, its a nice comfortable ride. Bought these cause the color matched the original tire colors that were on my 1998 Gary Fisher Aquila. These tires significantly changed the ride of my bike, a 1952 Schwinn tandem. If you are looking for cushy, this is it. It's a nice cush... and the reflective sidewall is great. I wish that it had a kevlar belt to prevent flats, but otherwise, it's all I want for this bike.